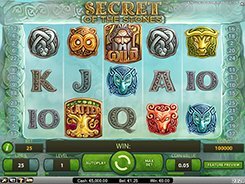 Secret of the Stones is a druid-themed video slot played over 5 reels and 25 fixed paylines. 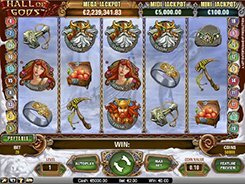 The symbols are stylishly designed playing cards from 10 to Ace, animal totems including Deer, Owl, Bull, Wolf and Snake as well as Old Druid that acts as a wild symbol. 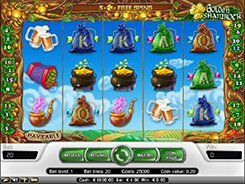 Since the paylines come fixed, there are only two wagering options you can configure: a coin value ($0.01 to $0.5) and the number of coins (1 to 10), so your bet can vary from $0.25 to $125 per spin. The top three cash awards you can win in the game are $6250, $3750 and $2500 (if you play max bet). 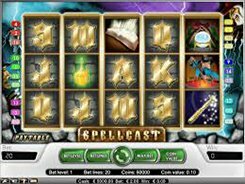 The slot has a scatter depicted by the Tree. 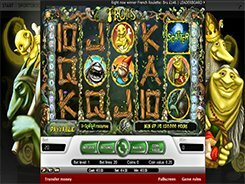 Three or more scatters award 10 initial free spins and activate a bonus game. If this happens, you are taken to the second screen displaying 20 stone totems. 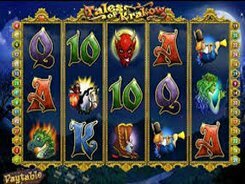 You are to pick the totems, with the number of picks being equal to the number of scatters that have unlocked the bonus game. 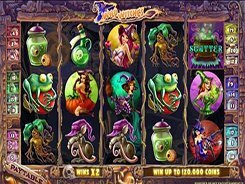 The totems can reveal the following free spins features: extra free spins (in addition to ten basic free spins), multipliers, wild reels and extra wild symbols (in addition to a regular Old Druid wild).